Subaru showed off the handsome VIZIV Tourer Concept at this year’s Geneva Motor Show, hinting at a future WRX wagon. The level of excitement was appropriate, but there’s already a WRX wagon of sorts for sale today—the Subaru Levorg. Well, for sale if you live in Japan, Australia, New Zealand, Europe, South Africa and parts of Asia. I’m here to find out what you Americans are missing out on. It looks like a WRX. Goes like a WRX. But it doesn’t say WRX. I’m currently behind the wheel of a Subaru Levorg; what do you want to know about it? All the Subaru essentials are here; turbo flat-four engine, a trick all-wheel drive system, a practical body. The Levorg, which by the way means “LEgacy eVOlution touRinG”, and incidentally “grovel” backwards, is an indirect replacement to the Legacy Wagon. Subaru will say it’s the “spiritual successor” to the fourth-generation Legacy with some styling cues taken from that car. 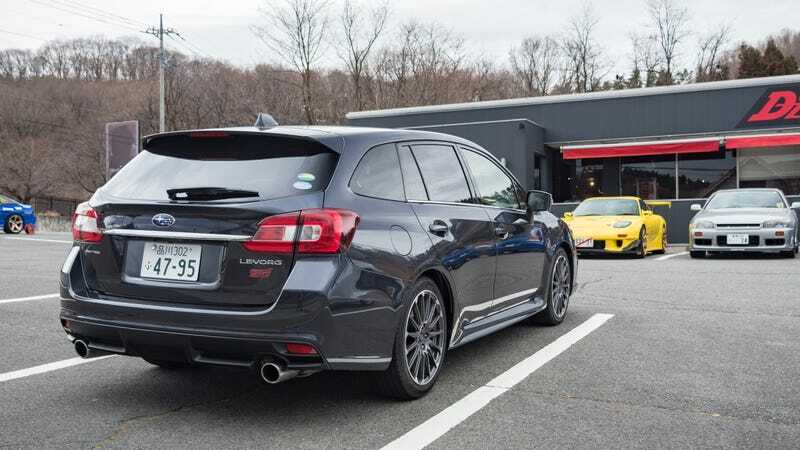 Yet unlike the Legacy, the Levorg sits on the same platform as the WRX. In every way but name this is a WRX wagon. The Levorg has been around for a while now. We got our first glimpse of it at the 2011 Tokyo Motor Show in the form of the Advanced Tourer Concept. In 2013, Subaru showed a pre-production concept of the Levorg before starting production in 2014. Mid-way through 2017 the Levorg received its midlife facelift for the 2018 model year. My test car is in STI Sport EyeSight trim (think M Sport, rather than full-on STI), hence the racier look. I quite like the look of the Levorg, especially with this STI Sport pack. It’s not a bad looking car. I’m also a sucker for a wagon, particularly fast wagons so this ticks all the right boxes. That said, I do wish the stance was a bit meaner. It doesn’t have the flared and chunky wheel arches we’re used to seeing on STI cars. To test it out I decided to take it on the roads around Mount Haruna in Gunma for two reasons; Subarus are made in Gunma, and this is where THE Initial D road is. Sure, the all-wheel drive (and laws, and fear) may prevent me from actually drifting it around the infamous “Five Hairpins” but I had to take this car up that road. I’ve been itching to drive on this road and this is a good enough excuse to load up the music player with Eurobeat. Far from being a normal cafe. This poor Veilside looked like it was just sat collecting dust. If you asked nicely they’ll sell this to you. But before heading up to the Jomo-Sanzan Panorama Highway (aka the Initial D road), I stopped by at Racing Cafe D’z-Garage, an Initial D-themed cafe at the bottom of the road for a quick bite to eat and basically to pay respects to this incredible place. Parked outside was an assortment of incredible cars including a Veilside Mazda RX-7, a Rocket Bunny Porsche Cayman, a Mazda Cosmo, and of course a Toyota AE86 Trueno. It was less cafe, more shrine. Pudding and model cars, what more do you need? Inside it was even more intense with BRIDE bucket seats for the tables, cut outs of Takumi and Natsuki, and many, many model cars. There’s only two things on the menu; Hachiroku-themed curry and Hachiroku-themed parfait. You can see a pattern here. Even though it was on a weekday there were still people coming in to check out the cafe and the cars they had on display outside. But I didn’t come all the way out here to eat some Hachiroku-themed curry. I’m here to drive on the infamous road with the Levorg. Oh, which by the way, is only available with a CVT. So it’s got that going against it right out of the gate. Let me know what do you want to know about the Levorg, and expect a full Jalopnik Review soon.